I’ve been struggling lately and I don’t know what to do. I am following Weight Watchers, I’m not actually going to meetings or anything cause who has that kind of money? I just have all the books an stuff and am doing it on my own. I thought if I followed the Weight Watchers rules I’d lose my extra weight, in a healthy way, it would help control my binge eating and I could get myself under control when it comes to food. For a while it was working, I felt like I was in a bit more control of what I was eating, and even though the program says I have to eat more food per day than what I am comfortable with I promised myself I would not cheat and restrict (or binge!) thereby giving the program the chance to do its thing. At first I lost weight, sloooowly, but the number on the scale was going down so I worked hard on being happy with the small decreases and not feeling like a failure because I wasn’t losing faster. But then I maintained for a week and I couldn’t figure out why…I had done everything I was supposed to, yet I maintained my weight. I thought maybe it was a glitch, my body getting used to this new system or something so I kept going and the next week I lost, so yay! Then the week after I maintained and I was pissed. If this was the start of some sort of pattern I didn’t like it. I want to lose every week, not lose then maintain then lose then maintain. I have weight loss goals dammit, and timelines for them and no way would I meet them if I maintained every second week. Grr! I decided to keep with the program and see what the next weigh in brought me, well, it brought me a weight gain of 0.5 pounds! Not impressed with that at all! That got me really down and I didn’t know what to do. Since I don’t go to the meetings or anything I didn’t have anyone to ask what I was doing wrong so I took a look at my tracking for the week, decided I had to be more active and more careful with my food. In case you don’t know how Weight Watchers works I’ll give you a quick rundown. You do some calculations to determine how much food you are allowed to eat per day, it is based on things like your gender, height, weight, age an stuff. When those calculations are done you get a number, anything from 26 or higher. When you eat something you calculate how many points your food is worth, some things are zero points (most fruits and veggies, salsa, diet coke, tea, water etc), everything else has points attached to it. You write down everything you eat every day and keep track of the points, once you’ve reached your points for the day you stop eating. You have to eat all your daily points, have to! It’s like rule number one, which I hate. There are also Activity Points which you earn by exercising, you keep track of how many you earned and if you want to eat more than your daily points you can eat some of the activity points. Oh, there are also Weekly Points, you get 49 weekly points which are like extras, so say there is a party or something you want to go to and no way you’d be able to eat a slice of birthday cake and not go over your daily points you can use some of your weekly points, think of them as your cheat points lol. Ok, so now you know the basics of the program. Well, even though I told myself I’d be more careful after the 0.5 pound weight gain I’d lost my belief in the program. I was down on it and wondering what is the point in going to all that work when I’m not getting results. Because of that thinking I started eating things I knew I shouldn’t, but I couldn’t seem to stop myself. I got a small ice cream sundae from McD’s one day, an Oreo Iced Capp and donought from Tim Horton’s another day, doubled my morning porridge a third day, you get the idea. Instead of one big binge I was making excuses to eat stupid things that normally I would never allow myself. After a while I stopped making excuses and just let the guilt wash over me while I drove somewhere, bought the food then took it home to eat. I felt like a loser every time I did it, I hated I was doing it, but I couldn’t stop myself. I spent all day today inside, ignoring the world and trying to think of anything but food. Which of course didn’t work because all I seemed to think about was food, sigh. I forced myself to not let myself have any treats and I tracked all my food like a good little Weight Watcher but it sucked balls. 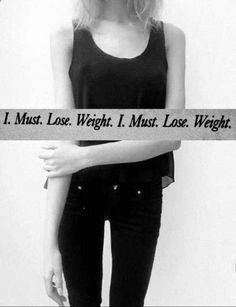 It seemed so much harder than before, and instead of feeling good because I was actively doing something to help me lose weight I was feeling like a loser, a failure, like someone who will never be able to act normally around food. Oh and to top it off today was my weigh-in day and since last week I have gained a pound! So all those stupid treats I was eating this past week did not get burned off with all my exercising (I thought they would have but I guess not…) so now I am even farther away from my goal and really struggling with not following my food urges and eating whatever I feel like whenever I feel like it. This entry was posted in Downer Day, eating disorder, fat, weight loss and tagged binge eating, eating disorder, fat, food restricting, gaining weight, weight loss, weight watchers on June 25, 2015 by foodobsessed79.